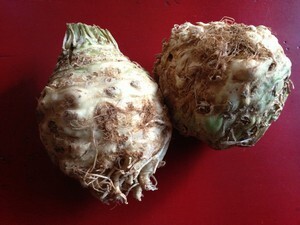 As you know the Accidental Locavore is a fan of celery root and it was widely available this fall at my CSA. 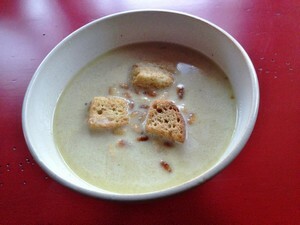 I found this recipe for Creamy Celery Root Soup on the Food Republic website and wanted to give it a shot. I stayed pretty true to their recipe, which makes a big pot of soup. Preheat oven to 375°. Toss celery root with 2 tablespoons olive oil, salt and pepper in a large bowl until coated, then arrange in an even layer on a large baking sheet. Roast for 45 minutes to an hour, or until completely soft, golden-brown and caramelized (this can be done ahead of time). Heat the other 2 tablespoons of olive oil in a large pot, over medium heat, then sauté the onions and garlic until translucent and just starting to color, 8-10 minutes. Add the roasted celery root, stir well to combine and cook for another 10 minutes. Add the stock and wine to the pot, bring to a boil then simmer for 20 minutes. Remove from heat and allow to cool completely, then transfer to a blender and purée in batches (or use an immersion blender). Return soup to pot over low heat and stir in cream. Heat until soup is warmed through. Serve garnished with the toasted pine nuts and enjoy. My verdict: Although not difficult, this seemed like a lot of work. Maybe it was just that I wasn’t thrilled with the results and found myself alone in the kitchen with a pile of large pans to wash. I ended up simmering it for about another 10-15 minutes to reduce it a little further as mine was rather thin. Still looking for more flavor I added a little cumin (maybe ½ teaspoon) to it at the end and tossed some croutons in my bowl. What’s good about this recipe is that it could be adopted for any roasted vegetable and, as I did, you can easily roast the veggies ahead of time. The next time I make this (or some version thereof), I would definitely add some garlic to the roasting pan and puree it in with the soup. Since I have an immersion blender, I skipped the cooling step and just pureed it in the soup pot (definitely not recommended if you’re using a non-stick pot). The roasted celery root, on it’s own, was really good, so remember that for a side dish! In a medium bowl, mix together the mayo, mustard, lemon juice and capers. Add the celery root, mix until well coated with the dressing, taste and add salt and pepper as needed. Serve and enjoy! My verdict: So good, took me right back to Paris! 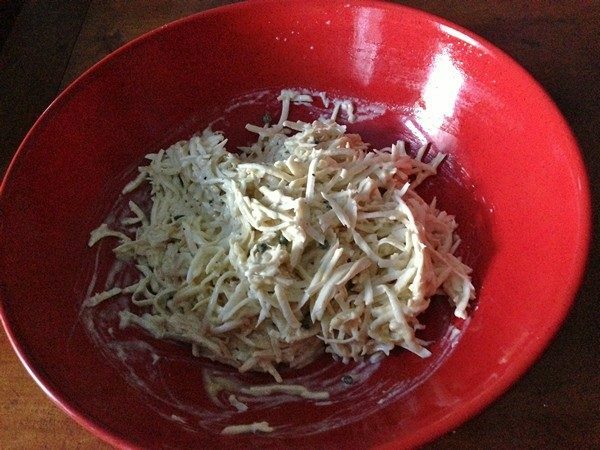 I used the grater disk on my food processor to grate the celery root, but you could use a grater or mandoline. To peel the root, cut off the top and bottom and peel the sides with a very sharp peeler (something I don’t own) or a paring knife. I remember the celeriac remoulade in France having capers, so I tossed some in, that’s up to you. And as always, homemade mayo is easy and makes the dish. If anyone has a recommendation for a really good vegetable peeler, please let me know. I have a drawerful of crappy ones.